With a voice vote, the Rajya Sabha today approved the Marriage Law Amendment Bill, 2001, seeking to ensure disposal of applications for alimony or the maintenance and education of minor children within 60 days of the date of serving of notice on the respondent. Uttaranchal and Uttar Pradesh failed to reach an agreement on the division of assets and liabilities in the power sector at a meeting held between the CMs of both states in New Delhi yesterday. Thirtythree villages around the temple town of Bhadrachalam in Khammam district of Andhra Pradesh were marooned and 674 families evacuated as the water level of the Godavari river rose above the danger mark of 53 feet today. 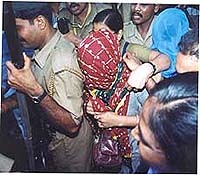 Swati Pal, beer-bar singer and Dawood Ibrahim's agent, and others being produced in a court at Kolkata on Wednesday in connection with abduction of shoe baron Partha Roy Burman. The government today informed the Rajya Sabha that it had no plan to reduce food subsidy and assured all possible cooperation to provide foodgrains to the needy to enable the states to check cases of starvation. The Municipal Corporation of Delhi, in a report placed before the Delhi High Court, has expressed its inability to supervise all private constructions in the city to ensure safety norms. Opposition members in the Rajya Sabha today staged a walkout, demanding an early withdrawal of the three circulars of the Department of Personnel which, they claimed, affected the promotion avenues of SC and ST government employees. Performing his duty as a ‘Swayamsewak’ (volunteer) of the RSS, Prime Minister Atal Behari Vajpayee today participated in the annual ritual of Guru dakshina (offering to the teacher) at a private ceremony here. The cacophony of chugging trains, honking cars and beeping mobile phones was today replaced by the ecstatic shouts of “Ganapati Bappa Moraya” and the tinkling of “lezim” bells as the elephant-headed God made a majestic entry into scores of houses across the city and the state on the occasion of “Ganesh Chaturthi”. The Central Bureau of Investigation has started follow-up action in the case registered under unlawful activities against Dr Jagjit Singh Chohan, the Minister of State for Home Affairs, Mr Vidyasagar Rao informed the Rajya Sabha. Tension gripped the walled city today as the DDA demolished 50 unauthorised structures near the Jama Masjid to rid the historic monument of illegal encroachment. Trinamool Congress MPs, led by party chief Mamata Banerjee, today met Home Minister L.K Advani and sought central intervention in curbing alleged post-poll violence, including kidnappings of businessmen, in West Bengal. The Bharatiya Janata Yuva Morcha will hold a demonstration at Suratgarh Thermal Power Plant on August 27. The Bill has sought amendments to the Indian Divorce Act, 1869, Parsi Marriage and Divorce Act, 1936, the Special Marriage Act, 1954, and the Hindu Marriage Act, 1955. The Union Law Minister, Mr Arun Jaitley, replying to a debate, said the bill sought to ensure speedy disposal of divorce cases. He admitted that the process of payment of maintenance was painfully slow due to which a large number of women had been suffering. Under the law, the lifestyle of the husband was also taken into consideration while deriving the maintenance allowance, he said. Mr Jaitley, welcoming suggestions and demand for a comprehensive Bill to amend various related Bills, said the government was equally concerned about some of the marriage laws but had to go slow on this as it had to involve personal law bodies before bringing in any amendments. He called up communities to help the government in this regard. Cutting across party lines, Rajya Sabha members today expressed grave concern over the “meagre” old-age pension and said politics should not enter into matters pertaining to elderly people. Members of various political parties felt that Central assistance of Rs 75 to old and destitute persons aged 65 years and above was too little and demanded that the amount be raised. Responding to the concerns of the members during question hour, Rural Development Minister M. Venkaiah Naidu said the situation was not satisfactory and shared the members’ view that the Central assistance and states’ contribution would not suffice. “The government is seriously concerned over this issue,” he said, adding that efforts would be made to increase the allocation. The Chief Minister of Uttaranchal Mr Nityanand Swami, after his return told mediapersons here today that a meeting between the two states would be held again in New Delhi on August 27 to sort out the issue. He said that he met the Prime Minister, Mr Atal Behari Vajpayee and invited him to participate in the Uttaranchal foundation day celebrations in November this year. The CM also got an assurance from the Union Railway Minister, Mr Nitish Kumar, for running another Shatabdi train between New Delhi and Dehra Dun. He also pressed the Railway Minister to introduce a fast train between Dehra Dun and Kathgodam to connect the Garhwal and Kumaon regions. Nainital is just 16 km from Kathgodam. He requested Union Finance Minister Yashwant Sinha that Uttaranchal be given the benefit of 90 per cent grant and only 10 per cent recoverable loans during the current financial year keeping in view of the grant of special economic category status to the hill state. The CM further revealed that UP had refused to take back 4,700 teachers who had opted for Uttar Pradesh. Meanwhile, the UP CM, Mr Rajnath Singh, has said that two of his ministers — Mr Hukam Singh and Mr Lalji Tandon — would represent the state in the next round of talks between UP and Uttaranchal slated for August 27. Since Uttaranchal is facing a shortage of senior IAS officers, UP has agreed to relieve three officers for posting in the new state. The Union Civil Aviation Minister, Mr Sharad Yadav, at his meeting with the Uttaranchal CM, agreed to release Rs 70 crore for the upgradation of Jollygrant (Dehra Dun) airport. As water level climbed to 53.8 feet, a major evacuation exercise was undertaken by the authorities since last night by shifting 3,800 persons from the low lying areas in and around Bhadrachalam to 15 flood shelters, official sources said here. Water levels at Eturunagaram and Dummgudem which rose alarmingly earlier have now started receding. However, road traffic in several villages around Bhadrachalam remained affected, the sources said adding that communication lines had also snapped. One of the helicopters pressed into relief work could not land due to swirling waters but adequate food and medicine were being provided to the flood-hit areas, they said. Meanwhile, the state government is also closely monitoring the flood situation at other places and taking all necessary precautions to meet any exigency. Replying to a short duration discussion on the Public Distribution System (PDS) in the country, the Minister for Consumer Affairs, Food and Public Distribution, Mr Shanta Kumar, said it was wrong to blame the Centre for any starvation deaths when it had provided 22 lakh tonnes of foodgrains free of charge to states under the Food for Work programme. He asserted that no state government had so far complained to the Centre that it was not lifting foodgrains because of sub-standard quality. The onus lay squarely on the state governments, he said. He reiterated his charge that the states were not lifting the foodgrains being supplied to them free of cost and not arranging for its distribution among the poor under the Food for Work programme. He maintained that the Centre had not failed in any of its three functions of procuring foodgrains, storing it and in arranging for its supply free of charge to the states. The Municipal Corporation of Delhi (MCD), in a report placed before the Delhi High Court, has expressed its inability to supervise all private constructions in the city to ensure safety norms. “The MCD does not have sufficient arrangements to supervise the construction of private buildings, nor does the owner of any building pay any charge to the Corporation for the same,” a committee set up to inquire into the death of 10 labourers in the collapse of a private building here in 1999, said. The MCD had set up the committee following the order of the court, seeking a comprehensive report on the reason for the collapse of the building which was under construction at Malkagunj in North Delhi, the responsibility fixed on the officials and the action taken against them. The report, which was placed before a Division Bench headed by Chief Justice Arijit Passayat last week, said: “The municipal staff cannot be held responsible for collapse of any building” due to use of sub-standard material or unsound engineering plan in contravention of the designs prescribed by the Bureau of Indian Standard. The panel admitted that action should be taken against the Assistant Engineer and Junior Engineer concerned who were in charge of the area when the tragedy occurred in June 1999. He said nothing had been done, although the government had repeatedly assured that these circulars would be withdrawn as early as possible. As the Congress member insisted on government assurance that the circulars be withdrawn before the end of the session, acrimonious scenes were witnessed with the ruling party and Opposition trading charges. It subsequently led to walkout by Congress, Left, Samajwadi Party and AIADMK members. 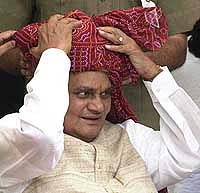 Mr Vajpayee, accompanied by his Cabinet colleagues associated with the RSS, saluted the “saffron flag” (Dhwaja Pranam) and made the “Guru dakshina” at the residence of Union Textiles Minister Kashiram Rana this morning, highly placed RSS sources told PTI. He also offered an unspecified amount in a sealed cover as donation, they said. The Bharatiya Janata Party national office-bearers will hold a brain-storming session (chintan) at Jodhpur on September 12 and finalise strategy for the coming Assembly and local bodies elections in some states. Party general secretary and spokesman Maya Singh told UNI that the meeting would be a follow-up of its earlier such sessions at Guwahati and Mussoorie. 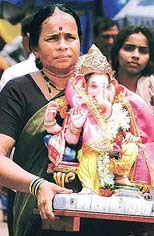 A woman carries an idol of Ganesha as the 10-day Ganesha festival begins in Mumbai on Wednesday. Young women dressed in heavy gold-embroidered nine-yard saris with traditional pearl-studded nose rings stood eagerly at doorsteps, holding a silver tray brimming with fresh flowers, agarbattis and hot steaming “modaks” to welcome Lord Ganesha, the annual visitor on the 10-day sojourn. The CBI had registered one case under the Unlawful Activities (Prevention) Act against Dr J.S. Chohan for committing, advocating, inciting and taking part in unlawful activities in foreign countries. Follow-up action in this case has been started after the return of Dr Chohan to India in June, he said. The minister said the Central government and the state government of Punjab were keeping a watch on the activities of Dr J.S. Chohan. The Punjab government has also informed that action would be taken against Dr J.S. Chohan as per law, as and when warranted. Earlier, nine cases were earlier registered by the Punjab government against him. He was convicted in one, discharged in another and seven cases were submitted as untraced. The state government was studying these seven cases, the minister said. Replying to a question on whether India had decided to lift barriers at specific locations along the Line of Control so that Kashmiris living in PoK could travel to Jammu and Kashmir for family reunion, the minister said as confidence building measures with Pakistan, the government had proposed to open new check posts at designated points along the LoC in Jammu and Kashmir. The checkposts are proposed to be opened at two places along the LoC. 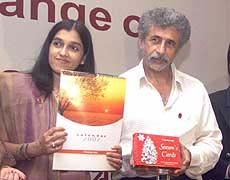 The Union Minister for Health and Family Welfare, Dr C.P. Thakur, informed the Rajya Sabha that accepting the request of the Jammu and Kashmir government and the scheme proposed for the adjustment of 53 MBBS and 14 BDS students of the erstwhile medical college in the state has been withdrawn on February 28 this year. He said the state government in May, August and October last requested the Centre seeking adjustment of MBBS and BDS students of the erstwhile medical college, in the existing three medical and one dental college in the state in excess of the approved facility. The state government in early February sought cancellation of the scheme. The demolition was carried out in response to the directives of Delhi High Court. DDA officials said that the demolition started at 11.45 am in the presence of a large number of Delhi Police personnel. The president of urban circle of the BJP, Mr Vijay Munjal, said party workers had been directed to start campaigns all over the state against the government. In a press note, Mr Munjal said in the fourth phase of the campaign started by the BJP against the Congress government, about 5,000 workers of the morcha would hold a demonstration at the power plant. Mr Munjal said the decision was taken at a meeting of the regional working committee of the BJP in Jaipur. He said demonstrations would be held at various electricity centres. He said the morcha had demanded that Bangladeshi migrants residing illegally in the state be sent out. He alleged that the government had allowed about 50,000 Bangladeshis to stay in the state to gain votes. The parents of a newly married woman were allegedly beaten up and dragged out of their house by her in-laws. According to information available from police headquarters, Parveena (23) was recently married to Sherudin, a local shopkeeper of Kakrala village under Noida phase II police station area, last month. According to the police, from the very first day of marriage, the woman was being tortured by her in-laws, who demanded more dowry. According to neighbourers, yesterday, when her parents came to her in-law’s house to settle the issue, they were beaten up badly, dragged and thrown out of their house by her in-laws. The police has arrested the father-in-law and sister-in-law of the woman. The Indian Agricultural Research Institute (IARI) has developed and released the world’s first basmati rice hybrid. This aromatic basmati hybrid, code-named RH 10, will yield around seven tonne a hectare, almost 40 per cent higher than Pusa basmati-1, the highest yielder so far. HANUMANGARH: The District Collector, Mr J.P. Chandellia, has asked the officers concerned to take steps to check the break out of diseases and supply potable water. He was speaking at a meeting to review the measures taken to control seasonal diseases on Tuesday. HANUMANGARH: A meeting of the District Tourism Development Committee was held here on Tuesday. Mr J.P. Chandellia, District Collector, said monuments and historical places in the district should be protected and hostel should be built in rural areas, to facilitate tourists.